This drama is the story of Hugh Davin (Stewart Granger), ledear of a group of late 19th-century Irish farmers, who, during the period of the Land War, rebel against the cruel and violent tactics of the local landlord. 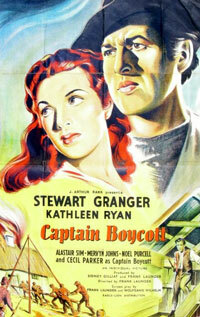 Starring: Stewart Granger, Kathleen Ryan and Cecil Parker. Producer: Sidney Gilliant, Frank Launder, Individual Pictures UK. 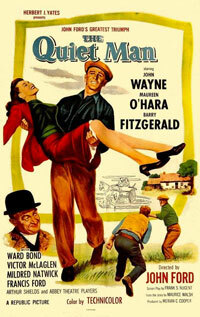 In 1951 John Ford's greatest movie "The Quiet Man" was made. It was set in the beautiful west of Ireland with filming being centred in the village of Cong on the Mayo-Galway border. A retired American boxer, Sean Thornton (John Wayne) returns to the village of Inisfree, where he was born in Ireland,to reclaim his family's farm. He meets and falls in love with Mary Kate Danaher, sister of the bulling landowner Squire Red Will Danaher. Danaher, angry that Sean bought 'White-o-Mornin', refuses to sanction the marriage, but several locals conspire to help the young couple. Memorable is the fistfight between Sean and Will. Producer and Director: John Ford. This British movie is based on the novel written by the Irish writer Walter Macken and scripted by Frank Gabrielson and Ralph Nelson. Ballinrobe streets, the Courthouse and Dermot O’Connor’s bar (formally the open loggia of the Ballinrobe Market House built in 1752) were used as locations for some scenes in the film. Some locals took part in the film: Mr. Luke Higgins, who played a court clerk, and Mr. Harry Carthy. Two Liverpool orphans Finn and Dervla Dove (Londoners in the original book) escape their vicious Uncle Tobias Cromwell (Uncle Toby) in aim to reach their beloved Granny O'Flaherty, who lives in County Galway in the West of Ireland. Here they discover to be heirs to their grandfather's estate and large fortune upon his death. But an unscrupulous Irish uncle, master of disguises called "Hawk" Dove, discovers to be a heir alike, if both of the children are dead or missing. He tries to make the children never seen again tricking them constantly. The Dove children's journey across Ireland isn't easy as soon Uncle Toby had been informed by Hawk Dove, disguised as a lawyer, about the money they can inherit. He decides to bring in the police. Finn and Dervla are dogged every step of the way by the police, their Uncle Hawk and Uncle Toby. 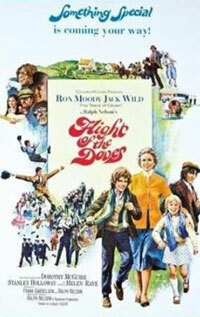 Roy Budd wrote the score for the movie. Two songs have become famous “You don't have to be Irish to be Irish” and “Far Off Place”. The first is sung during the St Patrick's Day Parade scene, while the second is sung by Dana who plays the role of Sheila, a tinker. “Far off place” is written both in Irish and English. Starring: Ron Moody, Jack Wild, Dorothy McGuire, Helen Raye and Stanley Holloway. Producer: Columbia Pictures Corporation, Rainbow Releasing. In rural Mayo in the 1950s, Bridie (Brenda Fricker), a lonely farmer's daughter hopes to find a good husband at the village ballroom, who can help her work her family's farm. At the local dance she realises that all the men of her generation have emigrated. For her the only chance of marriage is with the alcoholic Bowser Egan (John Kavanagh). Starring: Brenda Fricker, Michael Lally and John Kavanagh. 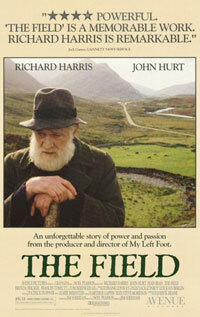 The family of 'Bull' McCabe (Richard Harris) has farmed a field for generations, sacrificing everything for that land. The field's owner is a widow, who decides to sell it around the time of the 10th anniversary of the death of her husband, by public auction. No locals in the village have money to buy it, but an American, Peter (Tom Berenger), whose ancestors are from the area, has deep pockets and decides to buy it to build a highway. The Bull and his son decide to convince the American to give up bidding on the field, but things go horribly wrong. Starring: Richard Harris, Tom Berenger, John Hurt and Sean Bean. Producer and Director: Jim Sheridan. This drama is the story of a young man, James (Daniel Craig) and a wealthy Englishwoman, Agnes (Greta Scacchi), in late 1800s Ireland. Agnes is a divorced woman, who smokes, drinks and rides horses astride on her vast property. James, who works for her, discovers a local agent wants to cheat her and so he shares the information with her. Knowing each other better they lead a romantic relationship, which soon becomes a turbulent and violent obsession. Starring: Greta Scacchi, Daniel Craig and Stephen Dillane. Location: Achill Island, Co. Mayo. Producer: J&M Entertainment, Isle of Man Film Commission, Bórd Scannán na hÉireann. At his house, the bishop reads from an advance copy of a novel "Budawanny: A Bishop's Tale" by Thomas Connor. He writes to the author telling him there is no reason he has to read it. A young ill woman, Marian, lands at a pier of the island and is brought to the priest's house, where she is cared for by a doctor and the priest. A short while later Marian recovers and begins to take on the role of housekeeper. Meanwhile the bishop writes a letter to the priest remembering the rules of religion. Marian and the priest lead a relationship. One day the young woman tells the priest she is pregnant, but the sacristan overhears the conversation. The priest hopes to look after Marian and the child, but the locals inform the bishop who call the priest at his house and drive Marian apart. On his return to the island, at the quayside he meets Marian who is leaving the island and discovers the sacristan has committed suicide. The bishop reflects on the events and tells his secretary merely to acknowledge the receipt of the book. Above all, he thinks, he needs to be prudent. Starring: Donal McCann and Maggie Fegan. In 1798 a small force of French troops sail to Ireland to support the local rebels against the British forces under Lord Cornwallis. Starring: Robert Stephens, JeanClaude Drouot and Niall O’Brien.